A key asset is our CAA-approved ATC training centre at Gloucestershire Airport. 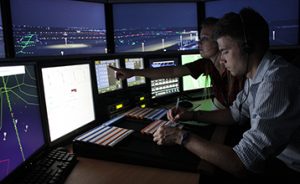 Here we deliver our ATC training business, with consistently high quality and results. An immersive ‘hands-on training environment’ gives students realistic work simulations, with a memorable experience of college life beyond the curriculum. The benefits of being air side are two-fold: Not only is the learning experience a lot more immersive being surrounded by aircraft, but we have developed a very close working relationship with the airport itself. We hold regular meetings to discuss how our operations can compliment each other, ranging from refresher training for their staff, to allowing our simulator operators the chance to witness air traffic in a live environment. A dedicated, air-conditioned simulator suite with ergonomic seating and individual console lighting. 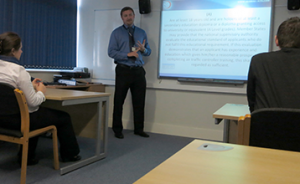 Classrooms equipped with Smartboards, projectors, full multi-media capabilities, and views of the airfield. 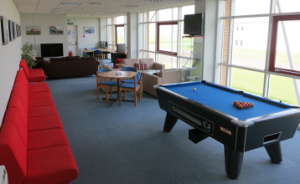 A comfortable student lounge with LCD TV, kitchen facilities, guest PCs, Playstation, study area, vending machines and pool table.